Today started off better than yesterday as far as mood but as the day wore on the worse it got. Without boring everyone with the details; I work with a bunch of idiots. About 2:30pm I had all I could take and I took the rest of the day off. Tonight was our district’s leadership banquet. I got home in time to make a Dutch Oven Cobbler. Peach to be exact. 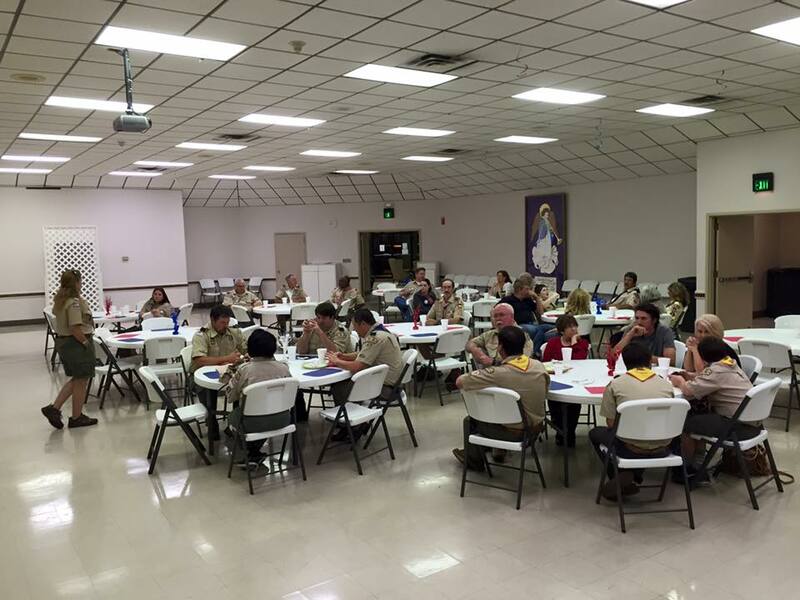 The leaders banquet is just a gathering once a year to recognize those leaders that have earned special awards throughout the year. I’ve got several but I’ve been so busy lately that I failed to get mine in on time. That’s fine with me because I’m not a leader that likes to be recognized, I’m a leader so that the boys can be recognized. I did get some treadmill time in tonight after I got home from the banquet. When I got done everyone had already gone to bed. I took a shower and now I’m watching a little Perry Mason as I’m winding down before going to bed. After a week that I’d rather not repeat, there’s no other way to get my mind off of things than to spend a Saturday doing what I like doing. It wasn’t too relaxing but at least it kept my mind occupied on other things other than work. Our Boy Scout troop set up a tent at our first annual Founders Day Celebration. 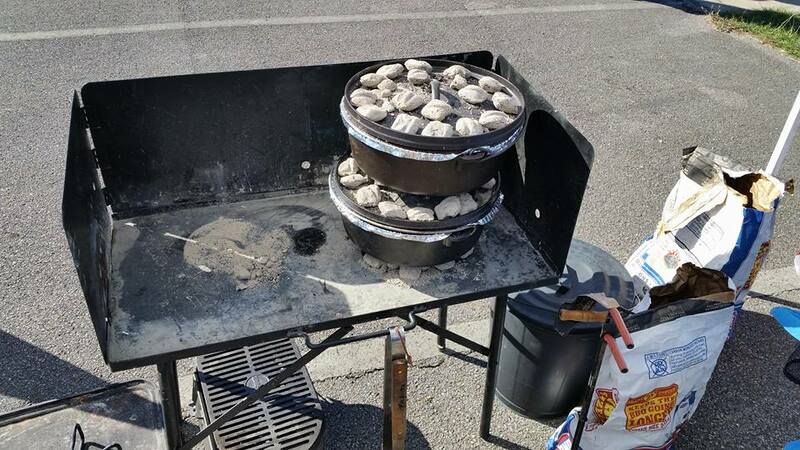 I brought a couple of my Dutch Ovens and made a couple of cobblers and sold them with all the proceeds going back into the troop. The day started around 5:45am and I think I finally got everything loaded around 5pm. It made for an extremely long day but I got to see old friends and made several new ones. We had to set up in a asphalt parking lot in which I had to stand for most of the day. Right now both my feet have swelled and they hurt so I’ve got them propped up. Even with the pain that I have in my feet and legs I think today was well worth it. Time to introduce another one of my hobbies. I love cooking in Dutch Ovens. I volunteer for the Boy Scouts and I teach these boys the art of cooking in these ovens. It’s a lost art and some people don’t even know how to cook in them. I was taught by one of the best and his tradition lives on through me. Pictured here are two main dishes, Easy Cheesy Meat and Potatoes (Top Left), Cowboy Stew (Bottom Center) and Bread (Top Right) I’ve done a few catering jobs which fed as many as 50 people. At last count I own 16 Dutch ovens and about a dozen different sizes of skillets. You guys ready to eat yet? The above picture is at a Civilian Conservation Corps (CCC) Camp located on the grounds of Oak Mt State Park located here in Alabama. 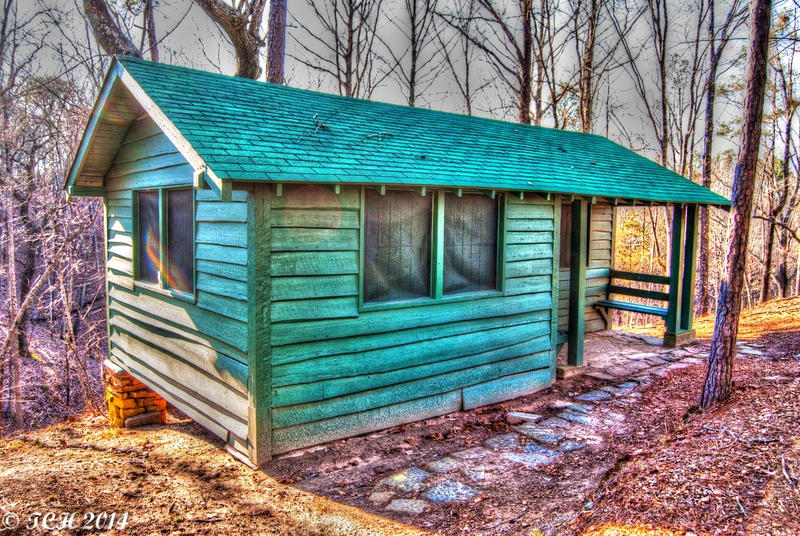 This cabin is part of this camp with was built back in the ’30’s. In past years it has served as a church camp, a girl scout camp and a boy scout camp. In 1976, the dining hall burnt to the ground and the camp decided not to rebuild. Fortunately, a couple of years ago, a group of Boy Scout leaders decided to put life back into this camp and rebuild the cabins. Through the use of Eagle projects they have rebuilt over 75 percent of all the cabins. Although there are no plans to rebuild the dining hall, they are planning on using another large building as a smaller dining hall once it get rebuilt. This photo was taken at our local Boy Scout office The wall on the left is where they inscribe all the names of scouts that have achieved the rank of Eagle. The three symbols include the Bald Eagle, the American Flag and Lady Liberty. My son’s name is on that wall. So very proud of him. I mentioned it in yesterday’s post and since then I haven’t been able to think much of anything else. We had some pretty bad storms last night but luckily the tornado’s didn’t happen. If you follow the link in the photo above it will take you to a site where I have posted all the pictures that were taken during the unveiling of the memorial our Boy Scout Troop did in honor of all those that perished during the tornado event of April 2011. As you can tell by some of the pictures it was a local news media event. Three television new’s media plus two local news paper media personal were there to cover the event. It was a very emotional event to say the least. It really brought our community together. Don’t come between a hawk and his snack. I’m wanting to do some landscaping work our Boy Scout meeting place. I went by there yesterday afternoon and had taken several photographs when I heard this loud whooshing sound above my head. I looked up to see this large hawk diving toward me with incredible speed. I ducked down and he flew just above my head as he dropped down low enough to grab this rat that was running across the path. He flew up and landed on a limb and I was able to capture these images. I hope you enjoy.